With less than a month left till the big weekend, we'd like to go over some things about how we are running the convention to help your games run easily. Feel free to email us with any questions you have after you've take a look at this email. 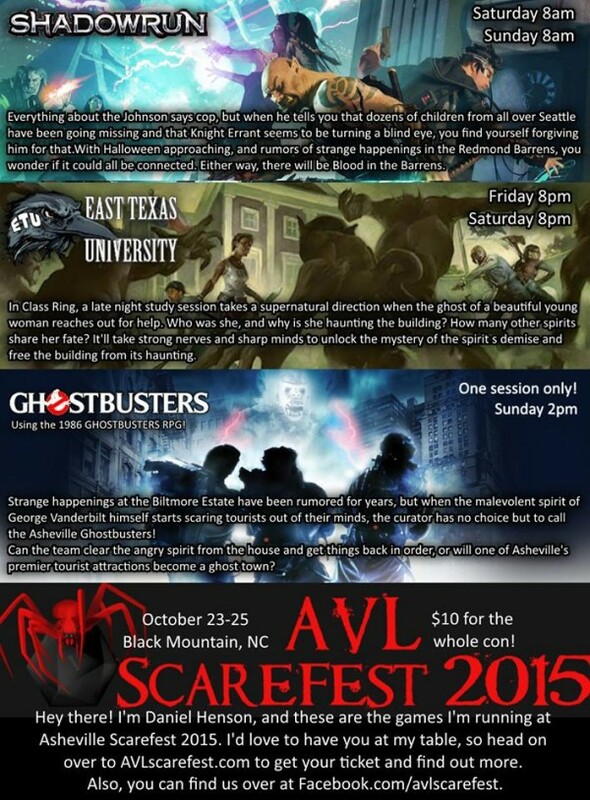 What is expected of me as a Game Master / Dungeon Master at Scarefest? You will get your complete schedule (Player and GM slots listed) when you arrive and check into the convention. For the slots you are running a game, we ask that you be at the table 10 minutes before the start of the game, so that you can greet your players and get them oriented. Unlike other conventions, there are no printed tickets or other paperwork you need to do. Please be prepared to accept players at your table up till at least 10 - 15 minutes after the start of your slot, even if doing so means taking a little extra time for introductions and game instructions instead of getting right to dice rolling. This will give stragglers or GM/DM's whose games didn't make a chance to play in the slot. After that 15 minute mark, you are welcome to turn away players that are late if it would be detrimental to your game. If it isn't too disruptive later, please help a wayward gamer and let them join. If you have any problems with any of your players that escalate beyond your ability or desire to deal with them, please don't hesitate to contact the convention staff (Amie and Michael). We are here to support you in running quality games, and can deal with any personal hygiene or social issues so you can concentrate on your game. If you are running a organized play table (PFS or DDEX), please go to your game system's organizer (DDEX: Chris Payne, PFS: James Becker or Dain Neilson) first, and convention staff as backup. Make sure you wrap up your game before the end of the slot. We will give the room a warning 15 minutes before the end of the slot. Your players need to be completely done with any paperwork, and able to leave by the end of the slot. Our breaks are 1 hour, and people need to be able to get out for food. If you personally need to stay a little late to pack up, that's fine, unless it's the last (ending at 1AM) slot. Everyone needs a little sleep. The final thing we need you to do is clean up any trash your players have left. Your table = Your responsibility. Another GM will claim your table shortly after you for another game, and would surely prefer to have a clean table to begin their story. I have no one signed up for my games! What do I do? It's early enough, we are still expecting a flood of players to sign up for the convention. But we could use your help to fill those seats. 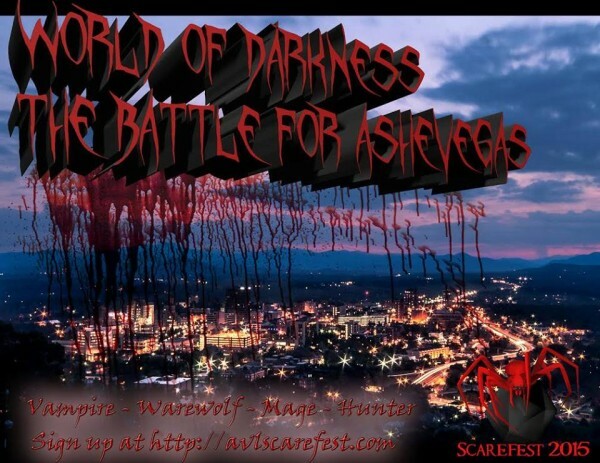 Make sure you have talked to your friends about Scarefest, and get them to sign up for your games. Daniel Henson and Richard Sykes went the extra mile, and created a flyer for their games, to share on Facebook and other social media. (Examples Below). While we don't ask you to go as far as these overachievers, a mention to your friends or a note on facebook may go a long way to filling up those empty slots. You are the best person to find players for your game. So, I hear that PFS is running some specials (Friday and Saturday Night), how loud is it going to be? Pathfinder Society specials are multi-table events with an overseer GM for the entire room and individual GMs for each table. Due to this interactive nature, they can get loud. The convention is held in one large hall with slightly detached wings, and there is some overlap. We are going to pull in some large rollable chalkboard dividers, and lots of stapled cloth up to keep the interactive special from interrupting the rest of the room. There will be a door shaped opening in the dividers so that all players, PFS or other games, can use both entrances. It is the day of the convention, and no one is still signed up for my games / My table didn't make (have enough players), what should I do? While we are printing schedules, the official record of who is going to be at your table playing is Warhorn. If your slot starts and there are no players listed for it on Warhorn, you are immediately released to find something else to play. A moment's preparation if your game looks thin beforehand is great: go ahead and figure out what table you would like to ask to play in. If you read this whole email, you'll see that you have a guaranteed 15 minutes to find a game to play. Also, the board game archive is going to be open all weekend with two tables available to play a wide selection of games. 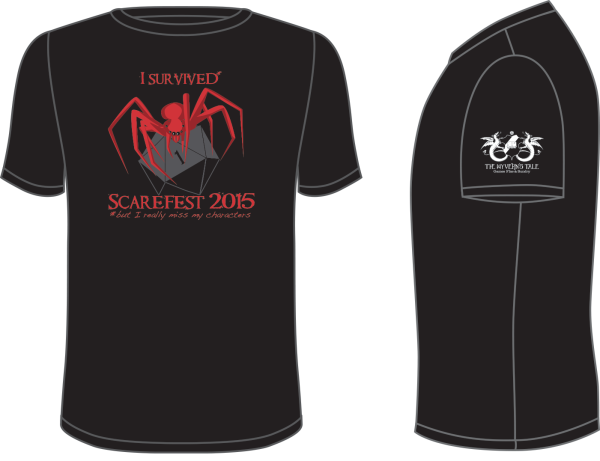 Don't forget to get your t-shirt!